Pick, personalize, print and present these certificates face-to-face. After personalizing a certificate, do a screen capture and post the .png file on Facebook or Twitter, or attach to a text or email. 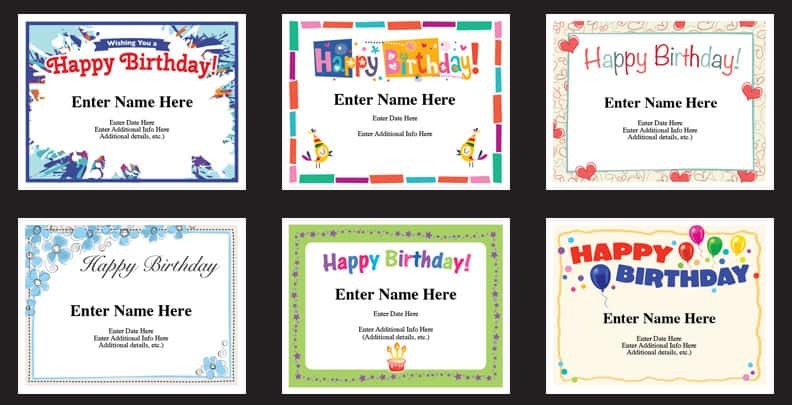 You’ll receive six stylish “Happy Birthday” certificates templates. A couple appropriate for kids and a couple appropriate for adults. Plus, a couple that could go either way. It’s easy to use these well-designed certificates. When you give a certificate like this it’s like giving a smile. Recipients love to receive these. You can type in a personal note and the list of givers directly on this certificate so that it looks very polished. Folks can hang these completed certificates on cubicles in an office environment or on bulletin boards. While others may take them home to post on office walls, bulletin boards or even the home refrigerator. Try this link you’re looking for the right birthday wishes messaging for these certificates. With purchase, you’ll receive a link that will enable you to instantly download the PDF file featuring these 6 birthday certificates. PDFs work on Macs and PCs. Just make sure you have the latest version of Adobe Reader (which is available for free). Personalize with name, date, and other details into the text fields. Then, print and present. It’s that easy! If you won a Mac, make sure you open the PDF directly from Adobe Reader. You can use these certificates time and time again. Do you have lots of friends on Facebook. Rotate thru all six options to keep things fresh. 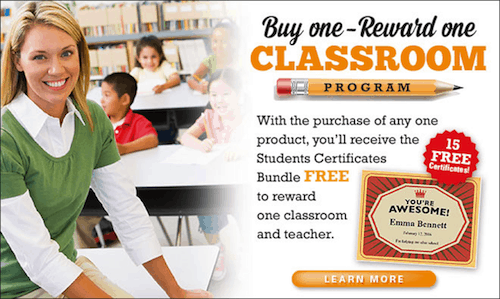 Buy the birthday certificates and receive a FREE Classroom Bundle!